Playing your cards on a turn-based battlefield. I closed in on Kaleos Xaan after stalking him for most of the match. He had run out of options. When battling the Songhai, it’s a matter of attrition. If you can make the match last as long as possible, they’ll run out of options. Once that happens, they’re dead meat. I held out until I could play my Shadowdancer, a minion that damages an enemy general and heals my general every time another minion dies. A few rounds go by and the Shadowdancer heals me and damages the enemy general enough that I can move in for the killing blow. I wipe out the last two minions that are preventing me from targeting the general before I finish him, sealing the victory. Currently in an open beta ahead of its 2016 launch, Duelyst takes the free-to-play competitive collectible card game genre and combines it with a strategy role-playing element. Think of it as Hearthstone meets Final Fantasy Tactics. 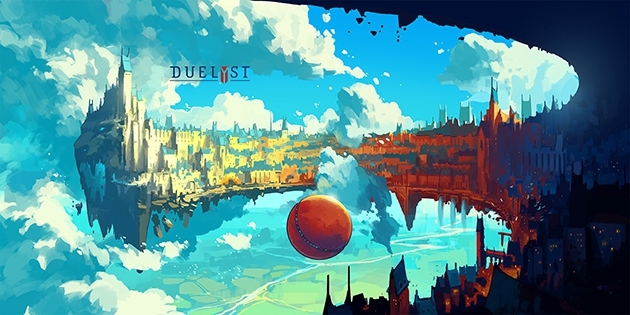 Developer Counterplay Games funded Duelyst on Kickstarter, but it isn’t some budget indie card game. Duelyst is highly polished, even at this stage, with stunning 2D animated graphics, a bountiful collection of cards split among six different factions, and strong gameplay I have a hard time putting down,and that doesn’t even factor in the lore that hasn’t been added into the beta yet. The factions and budding lore are my favorite parts of Duelyst. One of my all-time favorite games is Ogre Battle, a strategy game originally released on Super Nintendo. Duelyst reminds me a lot of Ogre Battle because of their shared high-fantasy settings, and because the characters in each game possess their own unique design and personality. In Duelyst, players mix and match their minion setups, based on the available cards, in the same way one could customize the squads going into combat in Ogre Battle. Every faction in Duelyst has its own individual minions, along with neutral minions. They all bear their own attacks and attributes, similar to Ogre Battle and many of the follow-up games in the series, including Final Fantasy Tactics. We don’t know a lot about the actual story or how factions are related and will interact, but I’m intrigued by why these highly-detailed generals and minions are battling each other. Duelyst’s story and lore has been in development for over two years and Lee, who was lead producer on Diablo III, promises “25,000 years of story hooks.” Every card has its own flavor texts and quotes and Lee wants the story to be “perfect” before the game releases. “Every card has its own story. It’s important to us as a company because we care about our intellectual property and world,” he said. Players take on the role of one of six distinct factions. The Lyonar, Songhai, Vetruvian, Abyssian, Magmar, and Vanar each bring a different gameplay aspect to the grid-based table. Each acts as a class with cards that lean towards specific attributes or skills. Lyonar is more tank heavy, with cards that offer a better balance between defense and offense as opposed to the Songhai, which could be considered something like a DPS class. I spend the bulk of my playtime with the Abyssian and Songhai factions. They’re more or less designed for killing off the enemy as fast as possible. The starter decks do enough to get players acquainted with the game. Playing as any faction will level up that faction, and players earn more cards and gold via wins or quests, which function similar to Hearthstone’s daily quests. Gold buys Spirit Orbs, which function as the game’s card booster packs, offering five random cards. Spirit Orbs can be purchased with real world money, but there isn’t an emphasis on paying to win. No matter what you unlock, you still need to build the right decks. Two players can play the same faction and have completely different deck builds and play styles. For example, I prefer to play a faster rush-down style. That means I’m relying on numerous spells and expendable, high-damage minions to secure a win as fast as possible. Someone playing as the same faction may try to slow the game down by forcing me to throw out spells and minions while they absorb as much damage as possible, before forcing me into a loss with nothing left to play. Not every game will end in such a glorious fashion as the one I described at the beginning of this story. In fact, it’s fair to say most won’t. Losing comes with the territory in this type of competitive game-- the losses can mount up, and it can get frustrating. Making gains in Duelyst isn’t always obvious. Sometimes cards look appealing because of their attributes or skills, but how that card interacts with the rest of your deck is also important. In my experience with DPS builds, adding a high defense minion with little attack puts me at a disadvantage because it takes the place of something that can cause damage right away. It’s a wasted minion play that prolongs the game when I want it to end as fast as possible. After going on a three game-winning streak, my first, I was definitely feeling like I had a grasp on what it takes to win in Duelyst. Six straight humbling losses have me evaluating what I’m doing wrong. Winning doesn’t come easy but, win or lose, I feel like I’m getting a better understanding of how to compete. In one particular case, playing as Abyssian against a Vetruvian opponent, I used positioning to my advantage. Vetruvians commonly spawn Ethereal Obelisks that summon one-round, disposable dervishes. I had a Shadow Watcher on the playing field, which gains one health and attack for every minion that dies. After sacrificing my minions by killing off as many of the Vetruvian’s minions and dervishes as I could, I teleported the obelisk away so I could move my Shadow Watcher, who was now up to 10 attack and health, for the final kill on the Vetruvian general. He conceded the match, realizing he had no chance. Duelyst does a great job of rewarding progression and keeping me invested in the game. Playing similar games, it’s easy to tell when I’m outmatched. Too often, I’m losing to things out of my control, as if the game had been decided before it even began. In Duelyst, a loss can be as simple as the hand I’m dealt or as complex as putting yourself or in the wrong position on the battlefield that won’t have ramifications until a few turns down the line. Building a winning deck (or multiple decks) is challenging. The community has put together numerous walkthroughs for deck builds and play styles for every faction, and they are helpful, but only if you have the right cards. Most players starting out won’t because the starter decks are limited and the cards you get from gaining levels are pretty weak. Spirit Orbs, whether bought with in-game gold or real world dollars, offer random cards. You’re lucky if you receive one card per Spirit Orb worth putting in your deck. Duelyst does include crafting, but at an early stage in the game I found myself troubled with decisions about what to disenchant. I hesitate to throw away a card I feel I might need later, unless I’m absolutely sure I won’t play one of the other factions down the road. The open beta is great, but Duelyst’s future has me the most excited. According to Lee, Duelyst has received roughly 80 patches and updates in the last year, with one coming every Tuesday. Sometimes it’s a simple bug fix and other times it’s to add content or tune the game. Counterplay pays attention to how the game is being played and the synergy of cards. They’re intent isn’t to drop a game and let the cards remain as they are for its lifetime. Counterplay has envisioned Duelyst as a viable eSport since its inception. The developer is laying a foundation to support competitive gaming, by supporting community run and professional tournaments, as well as adding spectator modes designed to allow commentators to see both players’ hands and the action in real-time. In addition, Duelyst offers spectators another layer of visual . 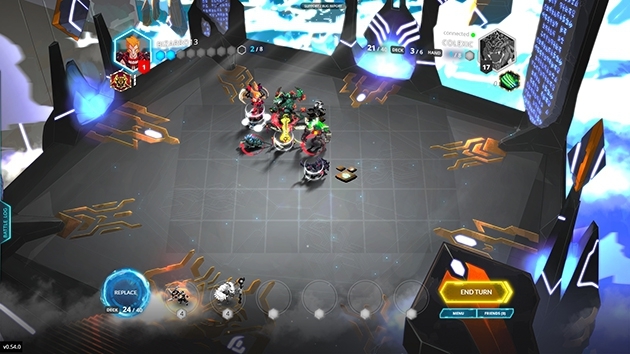 Lee cited the “spectator friendliness” of Duelyst as a chance to succeed in the competitive gaming realm. 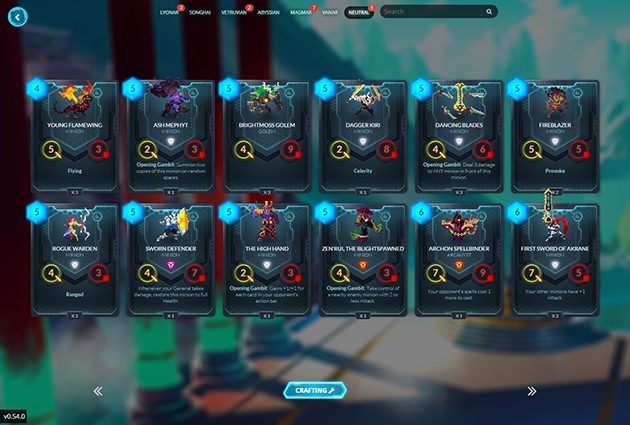 If you’re looking for an alternative to other competitive collectible card games, Duelyst is a good choice. It offers a unique take on the genre by fusing great card-based gameplay with overhead strategy RPG mechanics. The single player content isn’t fully realized, so we can only view Duelyst from its competitive side. You will lose a lot of matches, making progression tough, but if you’re willing to invest some time into building custom decks and learning some strategy, winning is very satisfying.